N00b here and trying to purchase my first Boxster. This 1999 I'm about to pull the trigger on has one tiny, odd flaw....It has a few bubbles on a speedometer face. A) Has anyone ever seen this? B) Carfax is perfect...what might cause it other than Florida heat? and lastly C) ideas on installing a new face? Thanks everyone! Hope to join you all in ownership soon! Last edited by wsmcdowall; 02-19-2019 at 04:58 PM. 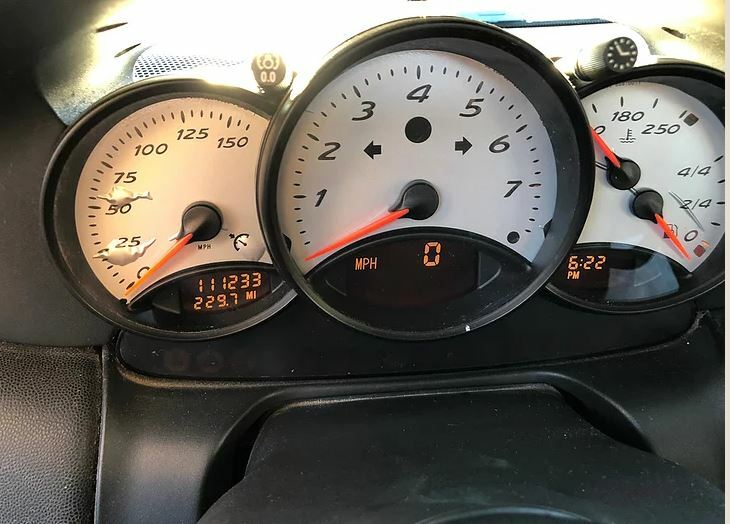 Those are the stick-on gauge faces that someone added. Fix by removing them (gauge faces will be black underneath) or buying a used cluster to swap faces with if you prefer the silver/white style. BTW, I see bubbles on all 3. Thanks for that! I'm not a fan of white anyway. At the risk of sounding helpless, I haven't been able to find a thread on adding or removing gauge faces. The whole cluster...yes. but not opening up the gauge. Are you aware of any how to's in that? Thanks again! Check youtube under 986 gauge cluster light replacement and you will find quite a bit. Thanks for that! I'm not a fan of white anyway. It's funny the difference on personal tastes..